Epic now has a low cost, quality 6 berth Motorhome that is available. This is a great way to sort transport and accommodation in one go!!! The Motorhome is NZ$285 per night. There is a min $19 insurance or lower excess with higher daily insurance rate. There is also a admin/roadside assistance fee which is based on number of days. Space and storage – Travel in luxury! This Mercedes Benz 6 berth River motorhome has all the modern comforts of home to make your New Zealand “Epic Adventure” a truly memorable one! Our high spec’d, diesel efficient, automatic Mercedes Benz has ample space for 6 to tour comfortably and safely. Brilliant even if just the two of you travelling with extra room and comfort! Fully self contained, you can enjoy the benefits of freedom camping off the grid. This motorhome is fitted with full solar panels and ample batteries (x3). With the fitted 2000w power inverter, you can even power the microwave and toaster without having to plug in to the mains! The Auto tuning Satellite dish allows you to easily tun in to New Zealand TV channels and the built in DVD entertains the kids on the longer drives and the inbuilt diesel heater ensure you are comfy even on the coldest winter nights! 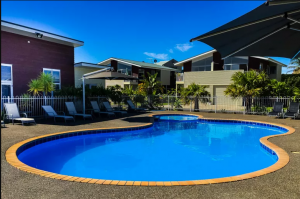 We have numerous hotels that we use in Whitianga Township we also have great house we rent for larger groups \. 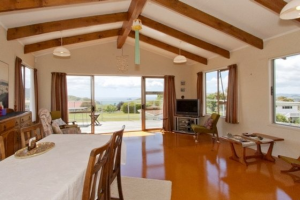 Our most popular house can cater for your group (4x people) @ NZ$250 per night. Additional persons, up to 8x total are @ $25per head. There is a one off linen and cleaning fee of $180. (plus a refundable bond). 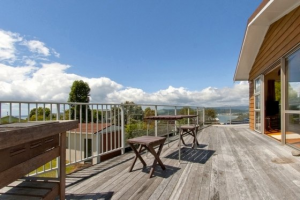 This house is 900m for the wharf and you can see the water! It is also in close proximity to all amenities. Another popular choice below – A little further from town, 5 min drive but probably our most popular choice. Same price as above. If you wanted to go for an Apartment option vs house, we have a great option 500mtrs from the wharf. 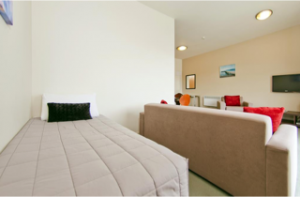 These apartments are set up with 1x Queen bedroom, and 1x single bed in the lounge includes linen. 2Bdrm options available. Very handy and good feedback from customers, and of course lower cost if just a couple of guys, or singles.. There are plenty of places to eat and drink in Whitianga as it is a tourist town and there are some nice things to do while your here. The skipper can also take you down the coast a bit to check out places such as Cathedral Cove, Hahei marine reserve etc. We even have arrangements with bars and restaurants. A popular choice is to get off the boat and head to the Mercury Bay Fishing club where they will cook up your days catch, and you get battered fish, chips and salad for NZ$5!!! And beers are NZ$5.50!